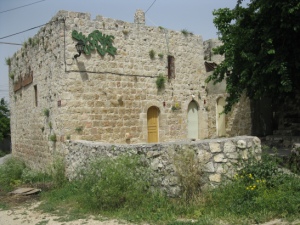 One of Rozana’s earliest projects was the People’s Museum, a unique place for storing the artifacts of everyday Palestinian life and the stories and histories of ordinary Palestinians. With funding from the Danish Center for Culture and Development, the Danish Representation in Ramallah and the Danish Arts Council, the Museum opened in October 2009 in a building restored by Riwaq in collaboration with the Rozana Association and with the assistance of numerous Palestinian photographers, designers, translators, and others. The Museum’s artifacts range from cooking utensils to embroidered clothing to a hand-made iron plough. Some objects are from the Canaanite era and some are contemporary art depicting the difficulties of living under the Occupation. While the Museum and its creators had no political agenda, the very nature of Palestinian life over the past 70 years necessitated relating ways in which the Nakba and the Occupation have affected daily routines. One of the Museum’s exceptional installations is the “Cinema”, located in the former stable, with a large screen and two small monitors for viewing any of the 25 videos of interviews with Birzeit residents. All of these videos and the stories, histories, photographs, and information about the artifacts are digitized to create a virtual archive.